If you’re like me, you stocked up on canned pumpkin, and/or you cooked, pureed and froze sugar pumpkins some time in October or November. I did both, and naturally, I didn’t use it all. So now spring is just about here, and I have all this pumpkin (we won’t even discuss the overabundance of cranberries in my freezer) staring at me every time I open the pantry or freezer. So I went on a pumpkin recipe hunt. 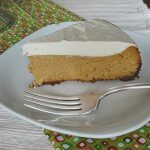 I actually had a recipe bookmarked in the Old Farmer’s Almanac Everyday Cookbook for pumpkin cheesecake bars. I mistakenly assumed they were swirl type bars, but turns out they weren’t. No matter! Problem was, the recipe called for a 9″x9″ square baking pan. Mine is 8″ square. So I decided to use a 9″ springform pan, and since I was going to do that, I might as well double the filling and make a cheesecake instead. So that’s what I did. 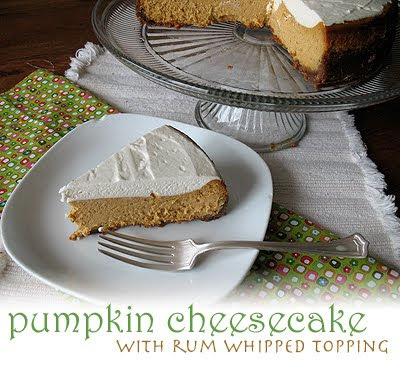 I’m a cheesecake lover and a pumpkin liker. 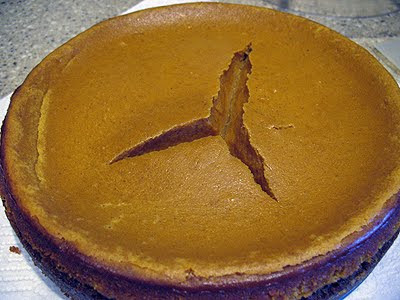 While this was really good, I prefer this perfect pumpkin pie recipe. 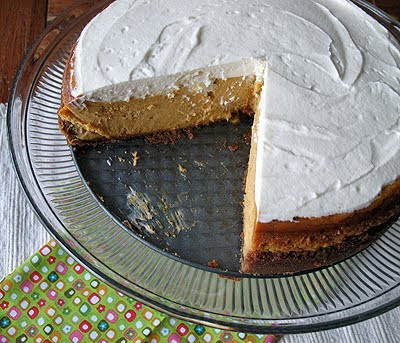 I realize it’s not a cheesecake, so we aren’t exactly comparing apples to apples here, but I’m more of a subtle pumpkin person, while this pumpkin cheesecake’s flavor is very prominently pumpkin. 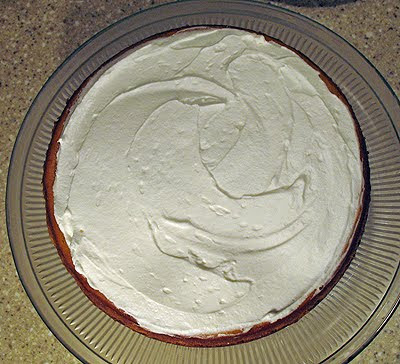 To dress up (hide) the Grand Canyon crack in the middle, I decided to use a whipped cream topping. I was digging through all of the extracts in my cabinet when I came upon some rum extract. I whipped up some heavy cream, added a couple tablespoons of powdered sugar, a teaspoon of vanilla and half a teaspoon of rum extract. 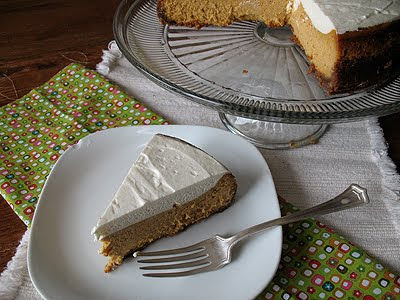 While taking a taste of the whipped topping on its own was a bit harsh, once it was paired with the pumpkin cheesecake it was a fabulous combination! 1) This recipe calls for 2 whole eggs and 2 egg yolks. 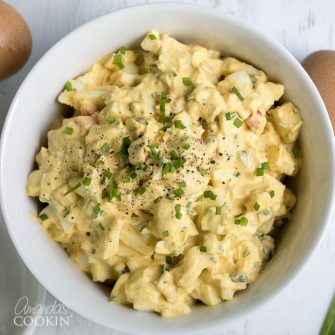 Use the two extra egg whites to make this tasty Egg White Omelet or freeze them and save them to use in other recipes, such as Angel Food Cake. 2) I use a food processor for mixing the filling ingredients. Most recipes (including the original one from the book) call for using a mixer. I like the silky texture that the food processor gives, but you can use a stand or hand mixer if you prefer. 30 If you prefer to make the bars from the original recipe, simply cut the filling ingredients in half (NOT the crust), use a 9″ square buttered pan, and bake for 45 minutes. The baking time and measurements for the crust remain the same. Preheat oven to 350 F. Butter a 9" springform pan. For the crust, break the graham cracker into a food processor. Add the brown sugar and cinnamon and process to a fine meal. Add melted butter and process again. Press crust into bottom of pan and about one inch up the sides. Bake for ten minutes. Remove from oven and set aside to cool. Reduce the oven temperature to 325 F.
For the filling, place cream cheese, brown sugar, eggs, and egg yolks into the food processor. Process until homogenous. Add vanilla and pulse to combine. Add remaining ingredients, pulse to bring them together, then process for a minute or two, until mixture is silky smooth. Pour the filling into the crust and bake for 55-65 minutes. The center should jiggle slightly and the outer edges will look dry. Turn the oven off and leave in the oven for 30 minutes. Remove and place on cooling rack, let cool completely. Place in the refrigerator for about an hour before adding topping. Using the whisk attachment on your mixer, beat heavy cream on medium-high for about 30 second. Stop mixer, add powdered sugar and both extracts. Turn mixer on low to incorporate the sugar and extracts, use a rubber spatula to scrape down sides if needed. Return mixer to medium-high and beat until stiff peaks form. 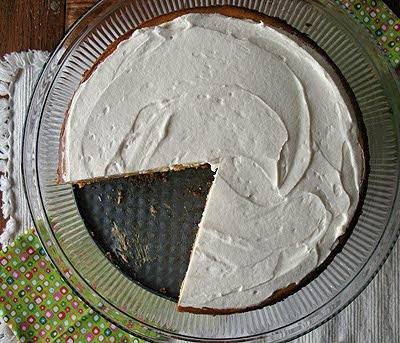 Spread topping on top of cheesecake and refrigerate for several hours before cutting. 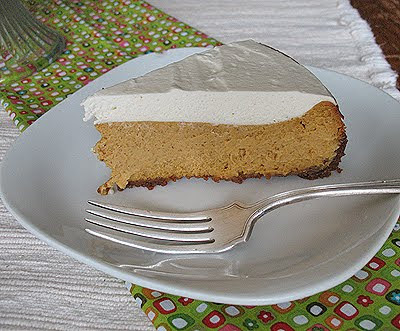 That cheesecake looks amazing, I have about four tins of pumpkin stashed in my cellar from last autumn, I guess I shouldn't be afraid of using them now that we're half way through the year!